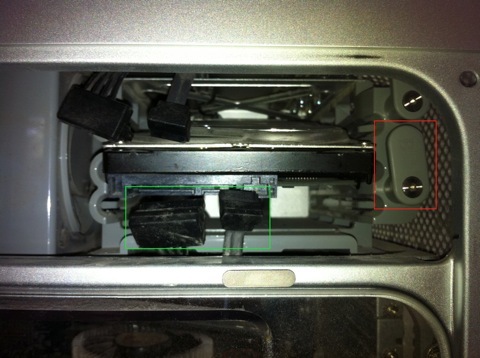 I had a dual G5 Mac that has served us unfailing for many years, just recently the fans have been running continuously usually a sign that the internal cooling system was failing. As luck would have it the machine failed the day before I bought a replacement machine! Whilst I had everything backed up to a second internal hard drive and selected key items backed up to an offsite backup I was left with the dilemma of how best to get the data from multiple accounts across to the new machine. Since it was likely the hard drives were perfectly OK it seemed the easiest strategy would be to try and access the information on the hard drives directly. The first step was to remove the hard drives from the G5, this turns out to be a relatively easy task. After removing all cables from the G5 and earthing yourself simply lift the latch at the back and the side panel can be removed. The hard drive is at the top back of the machine. First rotate the locking tab (red) upwards to release the drive and then disconnect the two cables (green). 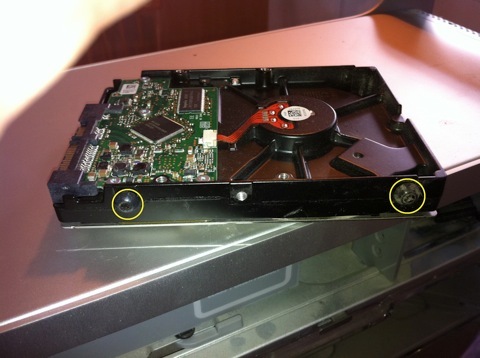 You can now carefully pull out the disc drive, try to only touch the sides of the drive and avoid the printed circuit board on the bottom of the drive. 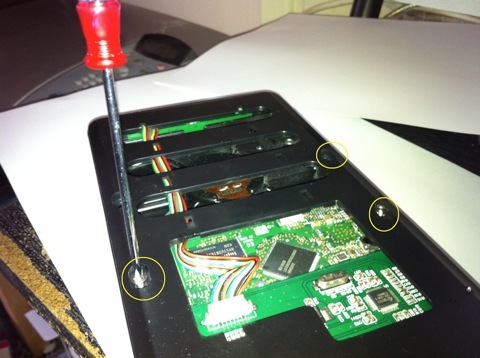 There are four guide screws on the sides of the drive (yellow), remove these using a Phillips screw driver. I guess you could just use a cable to connect the drive but there are a number of inexpensive enclosures, I used the Navigator USB2 3.5" SATA Hard Drive Enclosure USB 2.0 External HDD Caddy available from from Amazon. Open the enclosure and then attach the data and power cables (yellow) they can only go on one way round, if you look closely at the cables closely you can see a lug at one side that needs to match up. You can now seat the drive in the enclosure and unsure the trailing wires are neatly folded away, and then clip the top cover back on. 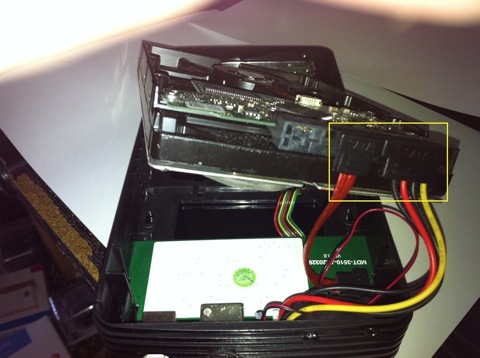 Turn the drive over and remove the bottom cover and screw the drive in place using the screws provided, replace the bottom cover and then sit the enclosure in the stand and attach the power and USB cable. 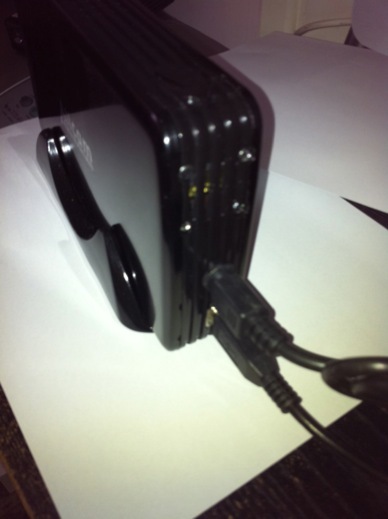 Plug the USB cable into your computer and switch on, the external hard drive should now appear on your desktop, you can of course add a custom icon to make it easier to identify. So now you can get access to all the data from the old Mac and as a bonus you have an external hard drive. Back to Reviews, Tutorials and Tips.